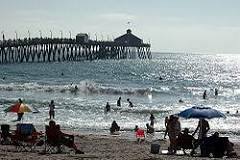 Imperial Beach has gained fame, residents claim, for two reasons. One is that it is the most southwesterly community in the United States, lying just to the north of Tijuana, Mexico. The second is that it is home to the US Open Sandcastle Competition every year, where competitors plan for months to build towering creations out of the sand that, some claim, is the best in the world. Beyond these exceptional statistics, there are plenty of other reasons to live in Imperial Beach. The area has a great shoreline, punctuated by its fishing pier. Residents and visitors alike gather on the pier on warm evenings and on weekends to fish and catch up. Young adults go there for entertainment. In the 1990s, the beach received about $10 million in restoration funds, so it is equipped with new restrooms, new lifeguard safety towers, and other improvements. But the renovations did not stop at safety. Imperial Beach was the recipient of several public art projects, enhancing its atmosphere and drawing more people to the area.